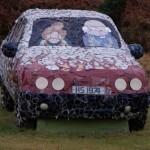 Last week we were over on the other side of Lochinver Bay exploring the Inver Park area. We were on the main drag running parallel to the shore. As you go on down that road, you pass the new block of what is now known as “social housing” which was built during the time my husband was the secretary of the Community Council. Many a meeting he attended “on site” coping with people’s fears about the houses being built there – but now they have been up a few years and very much look part of the landscape. In fact, I for one can’t remember what it looked like without them. They are far from unattractive, and although I am not very in favour of the constant building that goes on in this country, I do sometimes have to admit that a decent row of houses can actually enhance a place, especially if they provide good homes for people who couldn’t possibly afford the price of a house – even here. Turning left at the bottom of the road, you find yourself in a rather surreal world! This is the road upon which the famous Lochinver Pottery resides, and evidence of this is apparent from the moment you turn the corner. Let me explain. It is in this building, the original establishment, that the pottery is painted and fired. Of course when pottery is fired, there are inevitable breakages in the kiln, and quite a few years ago one of the owners of the pottery had a mosaic made around the front of the shop. Kaffe Fasset designed it, and for quite a while that was it – an attractive and unusual shop front. The Ullapool “branch” has been treated in the same manner. Of course when we are down there, we have to go into the shop itself. I don’t know when it first started – it certainly seemed to be pretty well established when we came here to live in 2002. I imagine it was one of the owners that came up with what you might call the signature colour of the pottery, which is a very distinctive and absolutely beautiful blue. It sort of goes from dark to light shades and features in pretty much all their designs. And there are a lot of different designs – all of which are displayed in all their glory from floor to ceiling in the shop. This is the place to come to buy it – on its home territory – and partly because this is actually the seconds shop! The pottery is very expensive as pottery goes, some of the biggest pieces going for several hundred pounds if not over a thousand – but they are very much worth the expense if you can run to it!! It is more than possible though to find something really good and reasonably priced in the seconds shop and a lot of people round here have at least one example of the pottery in their houses. I have several bits, including a beautiful vase my sister gave me a few years ago, and it would be almost impossible for anyone, except maybe an expert, to say that these pieces are seconds. On going into the shop, you are invited to go up a short flight of steps to see the artists at work. There are normally only two or three people actually working at one time, although there are quite a few, all women as far as I know, who work there. Because there are different artists at work, there are inevitably different styles of painting, and that makes for variation in the designs. I stood and watched Dorell working there once painting a salmon on an incipient fish serving dish, and just watching her stroke the brush over the pottery dish while chatting away to me was amazing – I so envy her talent. Young Hannah who works there was on the art course I took last spring, and I could instantly pick out her work among the finished pieces – her style is very distinctive. The kiln is also up there and racks of pottery dishes waiting to be decorated and/or fired. I don’t know where the pottery is actually made, but for me it is enough to see it all there ready to go, and to see the finishing process from plain sort of pinky coloured clay to the glorious finished article. 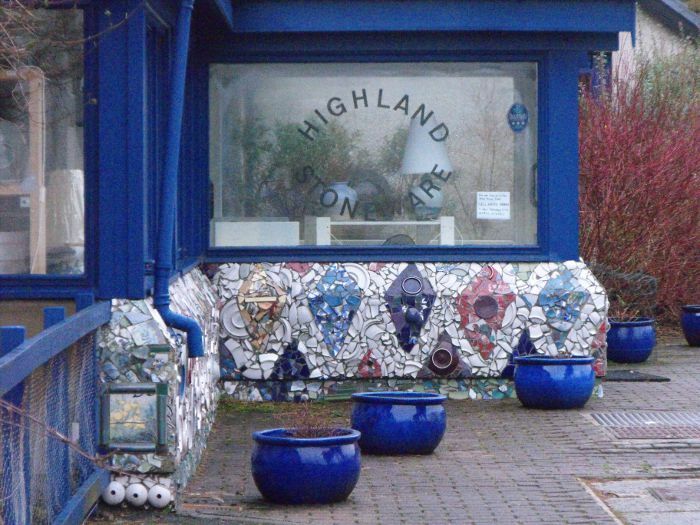 When I first came across the pottery, they didn’t have nearly as many designs as they do now, but they are very sensible and keep the old designs going for as long as possible while adding new, so if you were to break your favourite bit of Lochinver pottery, the chances are that you would be able to replace it. As I said, there are more places now where you can buy the pottery apart from this part of the country. When Mohammed el Fayed bought the Shin Falls over towards the east side of the country, he expanded the gift shop there and included some Lochinver pottery, and as he owned Harrods at the time, the pottery went down there too! Since then, I have seen it on sale in several odd places on the islands and over on the east side – it is very distinctive, mostly because of that gorgeous blue. If you are taking a cup of tea somewhere around the north of Scotland, and your cup is blue, have a look on the bottom – after you’ve finished the contents of course – and you will quite likely find that it was made in Lochinver. On dragging yourself away from the pottery – maybe or maybe not without punishing your credit card, and it’s hard not to! 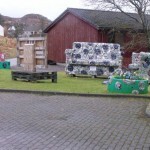 – you have to back track along the decorated road and out on to the main road, which actually finishes here. 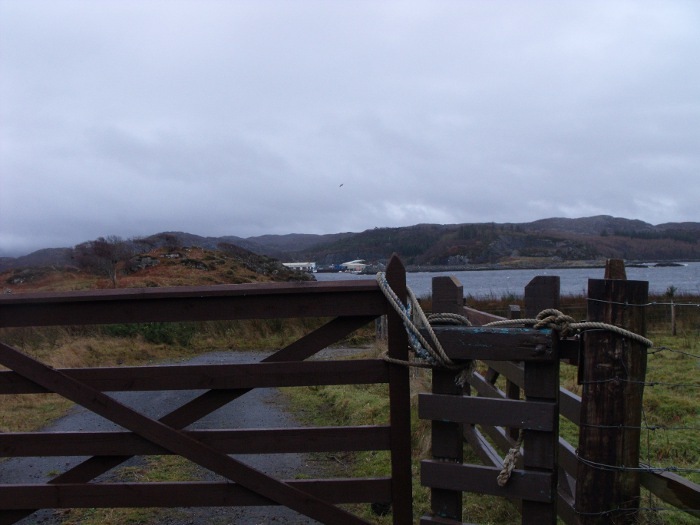 You have arrived at the “suburbs” of Lochinver – although I am sure that the residents of Glendarrach and Baddidarrach would not think of themselves as living in suburbs!! If you turn sort of half-left, you go down a small hill into Glendarrach – which means Oak Glen, darrach being the Gaelic word for an oak tree – and which is an attractive area of trees, gardens and a few houses. There are also wooden chalets there, some lived in and some holiday homes – which is the norm for houses of all sorts around here. Glendarrach is right down by the Bay and is relatively sheltered. Baddidarrach – or Oak Place – goes up the hill to the right and is rather more exposed. 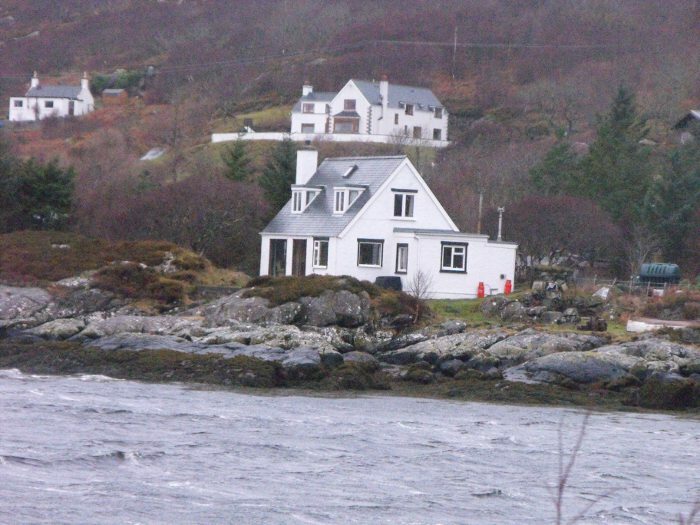 My friends, Lyn and Ken, live up there and they have a magnificent view of the mountains on the other side of the bay – Suilven, Culmore, Culbeag and as far south as Stac Polly – from the picture window in their sitting room (see photos of mountains in previous blog). The houses are rather cut into the hill, and therefore the grounds around them tend to be pretty steep and far less sheltered than the gardens in Glendarrach, but Lyn and Ken have created a wonderful woodland/wildlife garden with the burn running alongside. 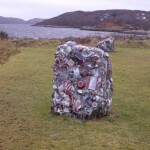 This entry was posted in Local area and tagged Lochinver Pottery. Bookmark the permalink.